A memorably bizarre melding of screenwriter John Milius's macho mythologizing and director John Huston's impish desire to tell a ripping yarn, The Life and Times of Judge Roy Bean (1972) is one of the weirdest westerns to come out of a Hollywood studio. (And I say this, having just reviewed The Hired Hand.) It's easy to see what drew Milius to the material, with its real-life story of a man who tamed a small corner of the Wild West and forged it in his image. Huston, however, seems to show little interest in the reality of Judge Roy Bean's life, often replacing the already-ridiculous particulars of Bean's biography with wilder fabrications. Huston essentially turns the whole thing into an episodic picaresque where the central rogue stays put instead of drifting around. 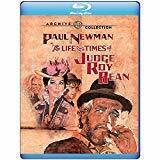 Paul Newman brings his signature smart-aleck toughness to his performance as Bean, an outlaw-turned-self-appointed-adjudicator with a skewed moral barometer. In an amusing early moment, Bean is shown drawing a beard and moustache on his wanted poster, but it's only because he has since grown a beard and mustache: he wants to be recognized. When he stops in a brothel, looking for fellow outlaws to impress, the inhabitants end up rolling him for his pocket change. They tie him by the neck to his horse, and send him off to be dragged to death. 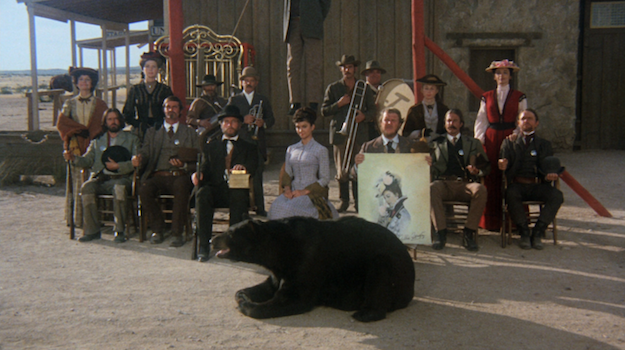 The rope snaps, and a sympathetic nearby villager (a debuting Victoria Principal -- yowza!) manages to get him a pistol. He returns to wreak his vengeance, successfully gunning down everyone in his path. He was never such a good shot before, so he figures God must be on his side now. (Huston never ignores Bean's megalomania, but he frequently presents it as cute and silly -- a decision that naturally would have driven Milius up a wall.) Bean decides to establish himself as a judge -- a hanging judge, naturally -- to govern the area. When a band of outlaws wanders toward his brothel, he decides to make them his lawmen (as a form of rehabilitation, we must assume). Principal's character, Maria Elena, offers to be Bean's lady, although he suggests the young gal stay in another room until she ripens up. The cast doesn't stop there, either. Jacqueline Bisset plays Bean's grown daughter in a long flash-forward near the end. Ava Gardner plays Lillie Langtry, the famed entertainer who so fascinates Roy Bean that he names his saloon "The Jersey Lily" in her honor. One of the few narrative threads that carries through the entire film is the question of whether or not Roy will ever actually get to see Lillie in person, but, even with Gardner billed in the opening credits, the film makes us wait out the question for longer than one might expect. Ned Beatty plays an outlaw who becomes Bean's barkeep. Anthony Zerbe and Richard Farnsworth both appear briefly as low-level baddies at different points in the film. 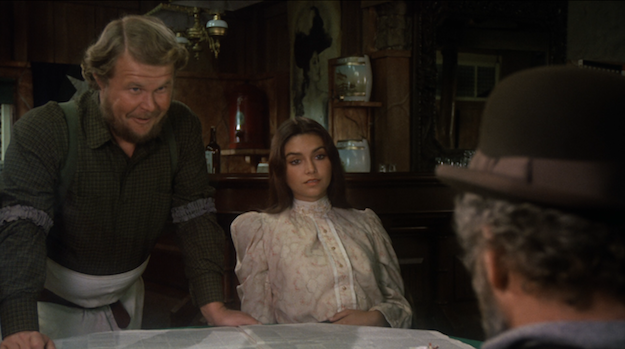 There's a lot to like about The Life and Times of Judge Roy Bean, even if it sometimes feels like a collection of scenes (some much better than others) rather than a cohesive whole. Still, there's a whole-hearted sense of just going for it that makes it hard to judge this one too harshly. It's something different, and sometimes that's enough. I noticed some Amazon reviews of this disc, arguing incorrectly that this looks like a flat transfer of the DVD onto Blu-ray with no upgrades. Cinematographer Richard Moore seems to be no stranger to diffusion, so it can be hard to pinpoint fine detail in this AVC-encoded 1080p 1.78:1 presentation. However, it is present and particularly noticeable throughout, if you look for it. For example, you can make out the beads of sweat dripping from Anthony Perkins's hair during his brief appearance. Colors are relatively sedate, although we are treated to some shots of rich blue skies and intense sunsets. The bitrate is extremely generous on this disc, so one suspects that this is pretty much the best we're going to see this one looking in HD. No significant flaws in the provided DTS-HD MA 2.0 mono mix. Dialogue and effects are fully intelligible, while Maurice Jarre's score supports the action effectively. One subtitle option: English SDH. Just the trailer, which is exceedingly long at 5 minutes. 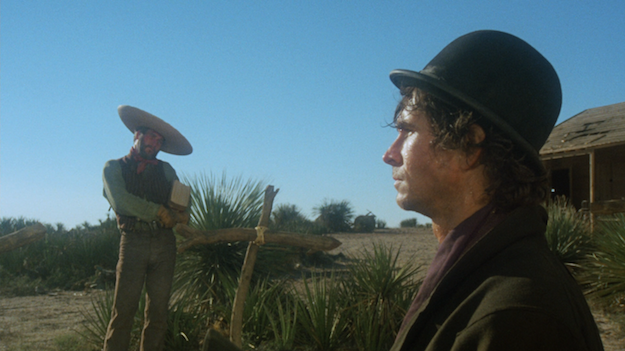 This is no ordinary western. Bopping from dark satire to broad silliness to sentimental melancholy, this flick flits through moods like sand shifting in a Texas tornado. For folks who like their entertainment kind of mad and off-kilter, this ought to do the trick. Recommended.